Sponsored by Spice & Tea Exchange. If you love to cook, The Spice and Tea Exchange is a perfect store to swing by anytime if you are shopping in Old Town or Annapolis, or weekending at the beach. Holiday seasonal gifts are aplenty here, it is hard to leave without trying something new--whether you are a spice and herb junkie and love trying new things, a discerning tea drinker or just love kitchen accouterments--almost certainly you'll leave with new things for yourself and gifts for others! Joy Quinn-Whalen is the owner of three Spice & Tea Exchange stores—in Alexandria, Annapolis and Rehoboth. After graduating from business school and working as a consultant, she started looking for a consulting entrepreneurial opportunity. After happening onto a Spice & Tea Exchange in Florida while on a business trip, she left with a big shopping bag and an idea for starting her own franchise. She found out that it Spice & Tea Exchange was a small but growing franchise, 11 stores at the time in 2009; now 44. It was 2009 and there were a number of vacancies on King Street in Old Town, Alexandria she lived. After doing some analysis, she and a business partner (Taruna Reddy) opened their Old Town location on King Street in 2010 and an Annapolis store on historic Main Street in 2011. Quinn-Whalen went solo in 2013 to open two additional locations in Rehoboth Beach, DE and her fourth store in Ocean City, MD in 2015. Quinn-Whalen describes her stores as a “wonderland of fine, savory, exotic spices and spice blends, gourmet teas, flavored sugars, salts, seasonings and accessories.” Spice & Tea offers unique and hard to find spices for the creative home cooks; many are specially blended onsite. Most custom blends are targeted to the cook who wants to prepare flavorful, healthy, fresh meals without huge effort, excess time or complex recipes. Quinn-Whalen is proud of the quality of her products and the knowledge of her staff. Check out their website for seasonal chef series, tea tasting classes and demonstrations: The Spice and Tea Exchange. TSTE® Mulling Mix Spice Blend is used to craft a lighter-bodied mulled white wine full of wintery flavors. 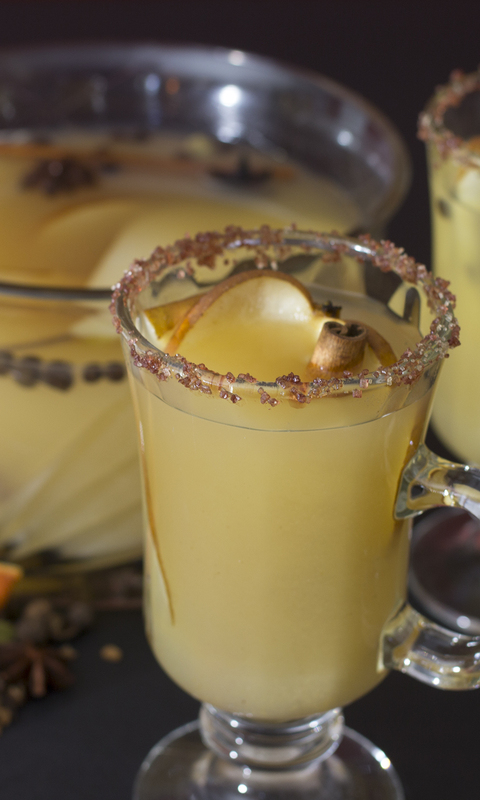 This warm & easy-to-make drink contains pear, cinnamon, and other lovely seasonal hints with an inviting scent that’s perfect for seasonal parties. Heat on very low heat for approximately 30 mins or until spices infuse to desired taste. Combine the TSTE® Raspberry Sugar and TSTE® Vanilla Sugar and rim each glass. Ladle mulled wine into glasses. Garnish each glass with a pear slice and cinnamon stick. KEEP beverage warm in slow cooker until gone!